Dine on water and experience the perfect dining setting for a unique and romantic honeymoon or anniversary dinner for two. For an absolutely unique and romantic dining experience, defy gravity and dine over the water on a floating glass island at our infinity pool above the coconut trees. Your private pool dinner is served with champagne, a gourmet 6-course meal and accompanied by live music. Our restaurants and bars are served with the most incredible ocean views. Watch the papaya and rosé sunset as you indulge in beachfront seafood BBQs, authentic Thai food and themed buffets with elevated ocean views, coupled with masterfully mixed cocktails. Take your taste buds on a culinary adventure. Sample a different cuisine each night of your stay. Savour authentic flavors with contemporary twists. Enjoy themed buffet nights hosted at our elegant Amber restaurant perched high on the cliff in paradise or rustic beachfront setting at Flames. 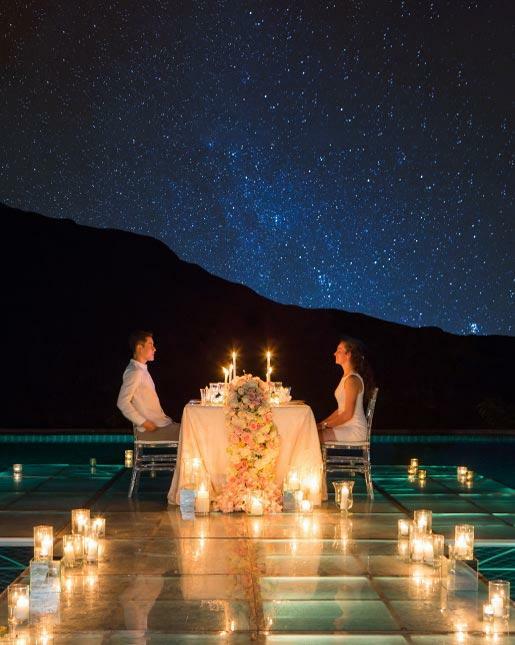 Our resort is famous for seclusion and luxury and we’ve created unique dining experiences to match a romantic beachfront date, an In-villa bbq on your honeymoon or an anniversary dinner on our private pier with your own chef for the evening. Take a master class in paradise. Experience a Thai cooking class that includes a trip to the local market. Learn to mix cocktails in the best sunset spot on the island. For something unique, try mastering the art of fruit and vegetable carving. Bring all the generations of the family together and celebrate special holidays in luxury and style in a tropical playground. Find the perfect villa with amazing ocean views for your festive celebrations. Enjoy special events and decadent buffets perched overlooking the Gulf of Thailand. Experience luxury and chic picnics for groups and couples. Spend the afternoon lazing and grazing on gourmet picnic treats and tropical fruit platters while sipping sparkling wine between dips in the ocean on a secluded beachfront for the afternoon.